GLIDER CHRONICLES 2011 – May 4th : Soaring in Blue. Wed 4th May: Conditions: Westerly. Good soaring. Launch attitude initially 10-15 degrees until 100-150’ (not all instructors agree on this), then pull back stick over 4secs into the climb. 2 circuits and 2 launch failures. Ready for solo. YES! Ready for solo! Great! Good day. 8kts up by Oil Terminal to 4500’. Then flew twice around the airfield including down to Alton and back. Duration 1hr 4mins. I want to say here that getting an hour’s flight from a winch launch is quite an accomplishment. On this day it was blue, i.e. no clouds to show you where you could find the thermals. So I was quite pleased, especially as when flying with the instructor I had been trying to stay on the south side of the airfield and not getting much lift. When solo however, I went to the north east where there is an oil “gathering” terminal and found what we call stonking lift up to the ceiling (max height) above Lasham that you can fly before going into an airway. 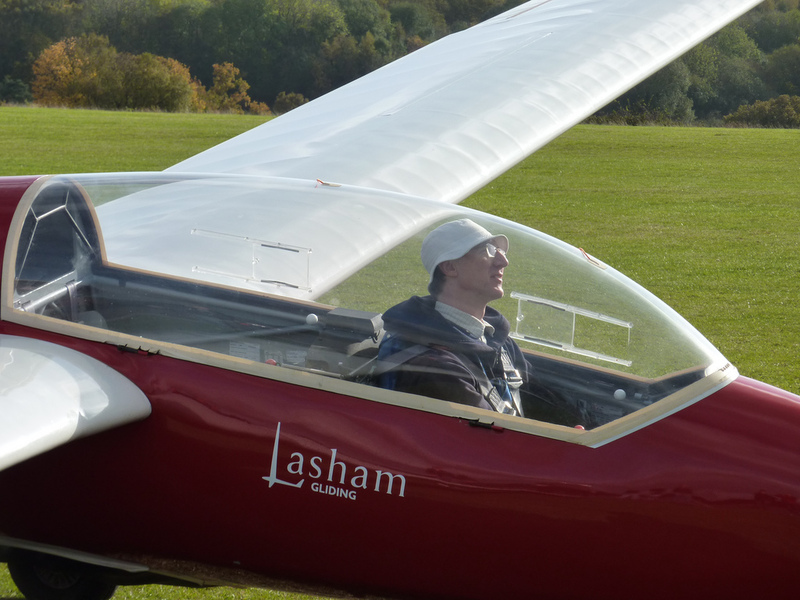 (The airway is at 5500ft above sea level (amsl) and Lasham is 618ft amsl so you can only go up to about 4800ft. I decided to stop 300′ short – just in case.) In the end my bladder instructed me to descend. Silly, I know, but I wasn’t expecting this. On days like this you get home and feel really good. For me it is where theory meets the reality of nature. Waiting for a winch launch. Hopeful of lift at top of launch. This entry was posted in Glider Chronicles. Bookmark the permalink. Thanks. I have found that this pastime is a really beautiful, artful mix of technology and nature in the best way. I am finding that it is probably going to take most of the rest of my life to get good at it! I have about 3 more catchup posts ready from May but only want to let them out one a day, rather than people getting too many emails.